UPDATE: Launch on 1-hour hold due to downrange spacecraft tracking issues. Now expected to launch approximately 8:30 pm Eastern time. 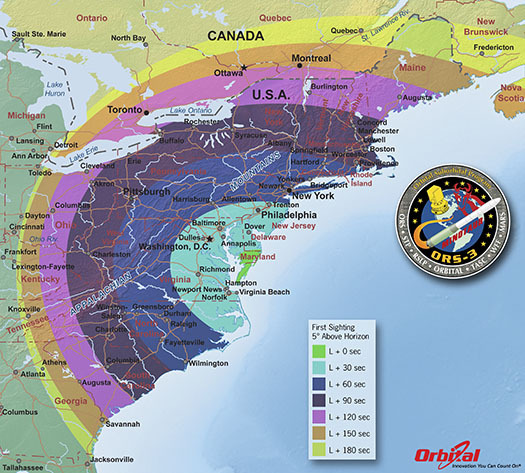 NASA and Orbital Sciences are set to launch the Air Force STPSat-3 spacecraft atop a re-purposed Minuteman II missile Tuesday, Nov. 19 from NASA’s Wallops Flight Facility on the Virginia Eastern Shore. The Minotaur launch vehicle is scheduled for liftoff at 7:30 p.m. EST, the start of a two-hour launch window. Weather permitting, the booster’s flame trail should be visible from Augusta Maine to Jacksonville, Fla.
Also aboard the launcher are 28 miniature CubeSat payloads, measuring 10 centimeters (3.9 inches) per side each. Of those CubeSats, 15 are Defense Department payloads, 12 were built by universities (including one each from West Point and Naval Post Graduate School) and one built by Fairfax, County, Va. high school students.